First, please make sure you have followed the instructions to to install the FullStory app in your Salesforce instance. Also make sure you have the appropriate permissions to edit page layouts in Salesforce Classic. You'll need to set your FullStory API key in Salesforce so that the widget can fetch the user sessions from the appropriate FullStory account. 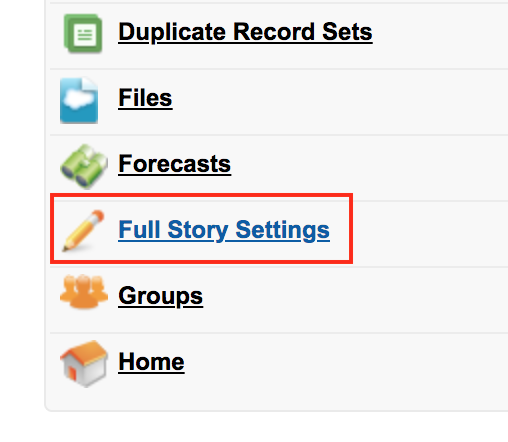 From the homepage of the Salesforce Classic UI, select the FullStory Settings tab. If you're unable to see them in the homepage, click on the + icon and look for FullStory Settings. In the FullStory Settings page, paste your API key in the text field and click Save Now. From the Salesforce homepage, go to any of the following pages: Contacts, Leads or Cases. Select a specific Contact, Lead or Case record. Click Edit Layout on the top right part of the panel. The example followed here is for a Contact. The process is similar for the other objects. Next, in the Contact Layout panel, select Visualforce Pages. You should see a Visualforce page called FullStory Sessions. 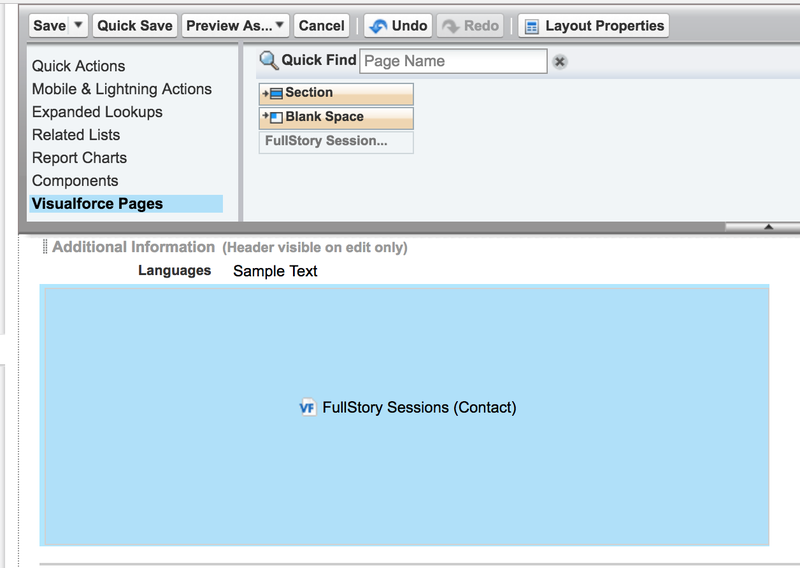 Drag and drop FullStory Sessions onto your contact page as shown and click Save. 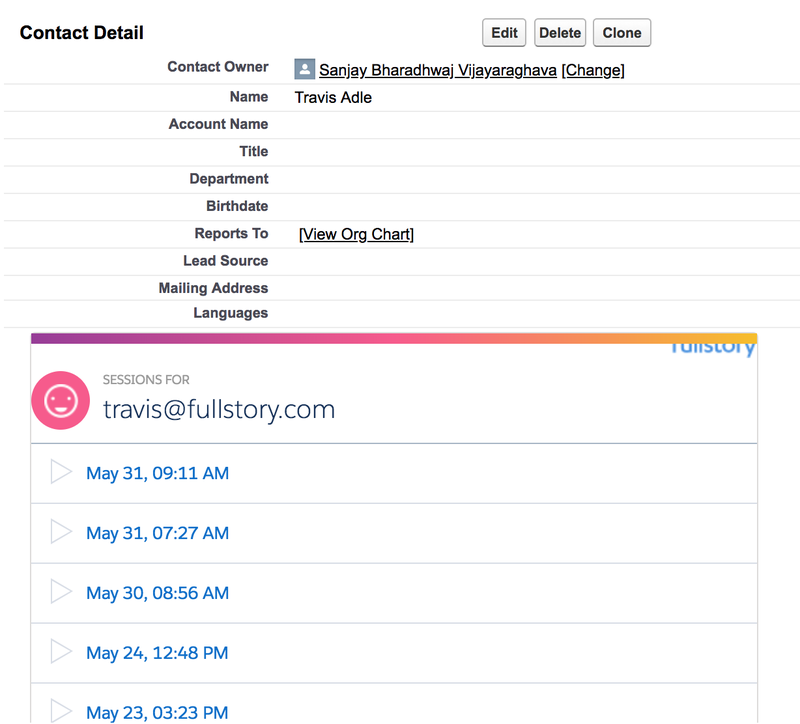 You should now see FullStory sessions for objects (that have the Email field populated) in the configured page. You can then click on one of the session links to watch the session in FullStory.